S2719DM is the budget HDR monitor from Dell. They had previously released the UP2718Q but that was significantly more expensive. So it's great to see something more affordable in the market. This is a monitor for those who want to enjoy HDR content but don't want to break the bank. Current price of the monitor ranges from USD $380 to $499 depending on where you buy it from. So what's the difference between this and the UP2718Q? The UP2718Q is a colour accurate 4K screen that supports up to 99% AdobeRGB, has maximum possible brightness of 1,000 cd/m2 during HDR mode and has more connection ports. That are the features that make the UP2718Q two times more expensive than the S2719DM. If you're getting a monitor just to watch HDR movies or play HDR games, there's really no need to go for the expensive UP2718Q. The UP2718Q is more suitable for people who create video content and value colour accuracy, e.g. editing HDR videos. Another important thing to note is, you need the supported hardware and software in order to enjoy HDR. If your hardware is not supported, you'll not be able to view your videos in HDR even if those videos may still play. For example, HDR playback is not supported on Mac OS. You'll need Apple TV 4K in order to output HDR to the S2719DM. When you play HDR movies from iTunes on the Mac, they play as normal non-HDR movies. On Windows, you need HDR supported graphics card. To find out more, read "Display requirements for HDR video in Windows 10". This is one of Dell's most beautiful monitors. I don't usually use the word beautiful to describe Dell monitors but the S2719DM looks fantastic. The design is very clean and minimalist. The back is a matte plastic back with a logo. The monitor is also quite thin. It's thickest right in the middle and then tapers to all the edges (about 0.5cm). The stand comes attached to the monitor and there does not seem to be anyway to detach it. It's no VESA-mountable obviously. There are only two HDMI v2 ports and a 3.5mm audio jack on the back. The port selection is definitely lacking but that contributes to the minimalist design. If you need more ports, Dell has many other monitors for you. Cable management is neat. The ports are situated directly behind the stand and the cables can go through the hole on the stand. By the way, the only cables included are HDMI and the power cable. That's the huge rubber feet beneath the metallic stand. The overall build quality for the monitor is excellent. On-screen menu buttons are located on the bottom right side. Buttons have firm feedback when pressed. When menu shows up, there are directional arrows to show you which button does what. No guessing required. Downsides to this design is there isn't much adjustability. You can only tilt the monitor 5 to -20 degrees. There's no rotate and you can't adjust the height. The bezels measure 0.5cm thin and uniform on all four sides. 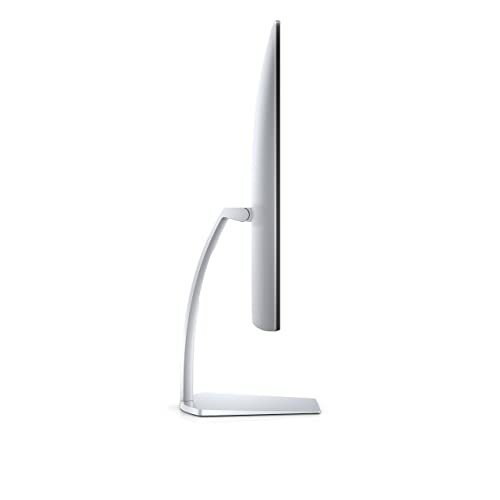 The thin bezels and design make the monitor look as if it's floating in the air. I've used a Spyder5Pro colour calibrator to calibrate the screen and these are the measurements recorded. The app that I used wasn't able to measure DCI-P3 but from what I've researched only, this monitor only goes up to 75% DCI-P3 and not to the marketed 85%. Colours are good out of the box. You probably don't need colour calibration. I do because I need colours on all my monitors to look consistent. If you're gaming or watching movies on this, this level of colour support is more than satisfactory. Photo above has the exposure enhanced slightly. Unfortunately, the unit that I have has uneven backlight. The top corners of the monitor are brighter. When watching movies (with top black bars) in the day, I could see those brighter areas too. Hopefully this is something that just affects my unit. And since this is an IPS panel, there's still the unavoidable IPS glow. The only hardware that I have that's capable of outputting HDR content is the Apple TV 4K. I played the HDR and non-HDR version of the same movie and compared. From what I can see, the HDR version was able to present more details in the shadow areas. In short, you can see more details in scenes that are darker, you can see details that would normally be lost into the blacks. Click for a larger picture. The difference is subtle. For example, when you look at the hair in the HDR version, you can actually see the highlight in the hair. With the non-HDR version, most of the highlights and details are lost and merged into black. In photography terms, this is called clipping the shadows. So having the extra brightness and contrast does improve video quality. Mind you, I played the HDR video on my HDR-capable Xiaomi short throw laser projection and even the shadows are clipped. So the real question is this. Are you someone who would appreciate the extra details in the shadow areas? Personally for me, not having HDR capability is no big deal for me. However, if I have an extensive catalog of HDR movies or games, then I would surely be tempted to get a HDR monitor. So it's good to see that Dell has made and is selling one at a more affordable price range for most people. If you're visual content creator, you can get other 100% sRGB monitors if the price difference isn't great. If you don't have HDR content, you won't be able to see the daily work. And if you need something that's really colour accurate, consider the 100% Adobe RGB Dell UP2716D (non-HDR). The monitor is already available for sale on Dell's websites. More details and specs there.